October 25, 2011 - The pilots of PSA Airlines, represented by the Air Line Pilots Association, Int’l (ALPA), on Monday took the next step toward reaching a new contract with senior management by meeting with a federal mediator from the National Mediation Board (NMB). PSA pilots, who fly regional aircraft under the US Airways Express brand, have been in direct contract negotiations with their management since June 2009. ALPA and company executives initially made steady progress in the early stages of negotiations. The parties reached tentative agreements on many of the non-economic sections of the collective bargaining agreement. The pace of negotiations has slowed recently, as the two sides began discussing pay, work rules, retirement, and other money-related issues. No significant progress has been made since September 2010, and recent discussions have not been productive. Under the Railway Labor Act, airlines’ labor contracts do not expire; they become amendable. The PSA pilots’ contract became amendable on June 30, 2009. Mediation presents an opportunity for a neutral third party, appointed by the NMB, to facilitate the process. The mediator does not have the authority to impose conditions upon the parties or decide issues. Talks will continue until the parties reach a contract or until the NMB determines the parties are at an impasse and releases them into a 30-day cooling off period, which could be followed by a pilot strike. PSA Airlines is an regional airline headquartered at Dayton International Airport in Vandalia, Ohio, that flies under US Airways Express brand for US Airways. PSA is wholly owned by US Airways Group. PSA has crew bases in Knoxville, Tennessee, Charlotte, North Carolina and Dayton, Ohio. It has maintenance bases in Charlotte, North Carolina, Dayton, Ohio, and at the Akron-Canton Regional Airport in Green, Ohio. The airline was established in 1979 as Vee Neal Airlines (named after its owner vee Neal Frey). Vee Neal Airlines' initial operations began from Latrobe, Pennsylvania. On 1 May 1980, the operation was expanded to include scheduled air services between Latrobe and Pittsburgh, Pennsylvania with a Cessna 402. The airline was renamed to Jetstream International Airlines (JIA) in December, 1983 to reflect the fact that it had just taken delivery of two Jetstream aircraft. On November 1, 1995, USAir renamed the recently acquired JIA to PSA in order to protect the trademark of Pacific Southwest Airlines, which was once a large carrier on the West Coast that USAir had acquired. 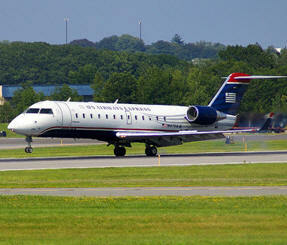 Since the acquisition by US Airways, PSA has transitioned from a fleet of turboprop aircraft to an all-jet fleet.